The Sounders gifted head coach Brian Schmetzer with a five goal win for his birthday. 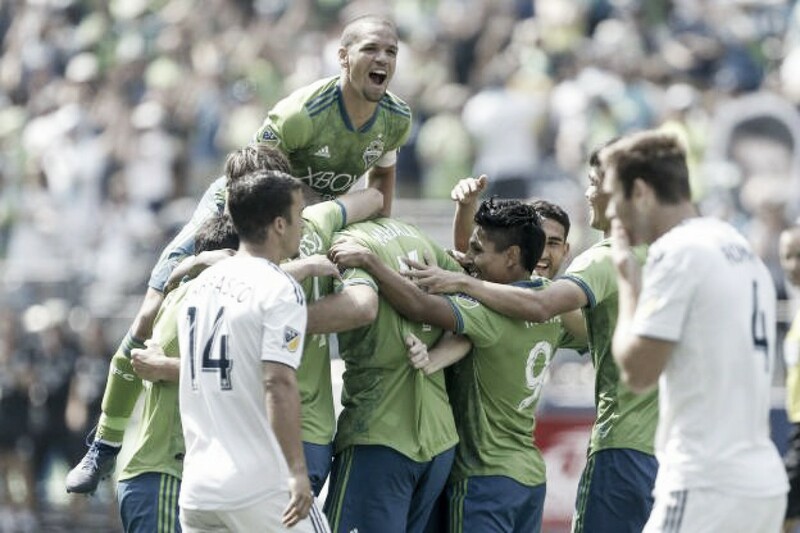 Seattle Sounders FC: Frei; Leerdam, Kee-hee, Marshall, Tolo; Svensson (A. Roldan, min. 84), Alonso (Bruin, min. 62); C. Roldan, Lodeiro, Shipp (Rodríguez, min. 60); Ruidíaz. LA Galaxy: Bingham; Steres, Skjelvik, Cole; Feltscher (Pontius, min. 57), Carrasco, Kitchen, Romney; Lletget (Jamieson, min. 63), Boateng (Lassiter, min. 73), Kamara. SCORE: 1-0, min. 3, Marshall. 2-0, min. 18, Shipp. 3-0, min. 50, Carrasco (OG), 4-0, min. 59, Roldan. 5-0, min. 67, Ruidíaz. Seattle Sounders FC, after having one to the MLS Cup final last season, started this season off in an abysmal way. Today however, they dispatched the LA Galaxy with a 5-0 win and picked up their sixth win in a streak that has seen them climb into the playoff spots. The Galaxy have had an up-and-down season themselves but today's performance exposed their weakness for all to see. 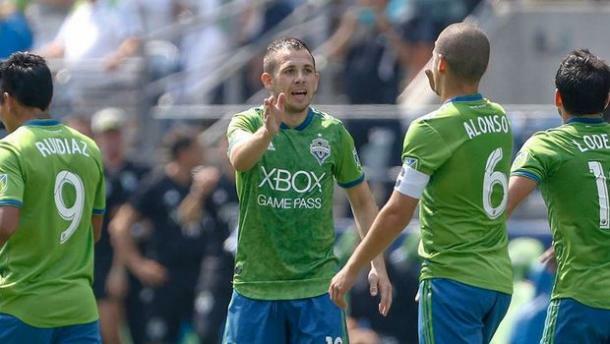 They may have some great attacking prowess, some of which was absent today, but their defense is one of the leakiest in Major League Soccer and the Sounders took full advantage of that. 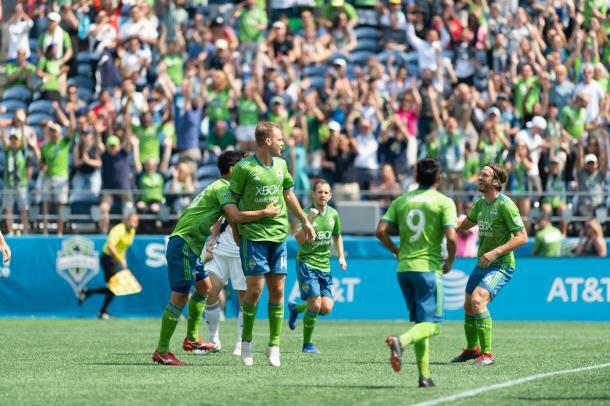 An early goal set the Sounders on their way when after a short corner, Nicolás Lodeiro picked out a familiar target in Chad Marshall and the big defender made no mistake from about six yards out. Ashley Cole then gifted the Sounders their second goal in the 18th minute when his kick out did not go far and was picked off by Gustav Svensson who then played in Harry Shipp. Shipp, who had only the goalkeeper to beat, with the rest of the Galaxy backline further up the field, slotted the ball home into the near post. Raúl Ruidíaz almost made it three in the 27th minute of the match after Lodeiro had picked him out with a cross but his header wasn't strong enough to beat the scrambling David Bingham. Chad Marshall then almost got his second right at the end of half time after Lodeiro once again found the defender from a corner kick but his header cannoned off the crossbar, giving the Galaxy some respite after an awful first half. The misery was piled on to the Galaxy fans in the second half as the Sounders ran away with the game. The third goal of the match came in the 50th minute when as Ruidíaz was harrying Jørgen Skjelvik in his own area, the Norwegian defender lost his footing, allowing Lodeiro to pick up the ball at the byline. His cut back did not find a teammate but it did come off of Servando Carrasco and into the Galaxy midfielder's own net. Cristian Roldan made it four after some great combination play by Lodeiro and Shipp allowed Roldan to drift into the box unmarked and right into the path of Shipp's cut back. Carrasco, like Cole before him, then gifted Seattle their fifth of the afternoon as his careless pass was intercepted by Ruidíaz and the Peruvian powered forward before smashing the ball past Bingham for his first goal at home in the Sounders colors. Ariel Lassiter had a chance to give the Galaxy a consolation goal in the 75th minute but his effort went straight into the hands of Stefan Frei. The substitute clearly should have done better with his chance and will rue to making the most of it. The Sounders have found their groove this season after a poor start looked destined to have them not make the playoffs this year. They have now managed six wins on the trot and seem to be in the mood to add to that tally. Ruidíaz' introduction into the team has helped as his prescence has created more space for Lodeiro to operate and the Uruguayan has taken full advantage of it.